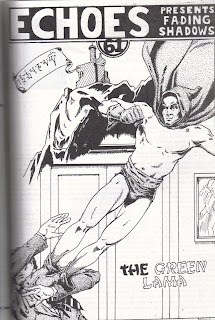 Behind the scenes at Frank A. Munsey’s DOUBLE-DETECTIVE, the powers that be wanted a super hero that could compete with The Shadow over at STREET & SMITH. They asked author Ken Crossen to come up with such a character, and he responded with, “I’ll try.” The character he came up with was the Green Lama. Like a journeyman preacher, the Green Lama stories followed a proven path for crime – from New York City to Cleveland, Ohio, to Hollywood, California, a trip by boat or two, and back to New York City. Though each story is a short novel, the whole series is one long continuing novel, and it’s best to read the stories in order of publication. The 14 stories run in sequence, with good continuity, and the same characters appear in the towns where they were originally placed. Almost like a real world. The Green Lama decided to fight crime when he accidentally witnessed a gangdom murder on the docks in which two innocent children had been killed. Jethro Dumont was returning to America from Tibet, where he had spent the last ten years studying to become a Buddhist priest. At the murder scene he had met Lieutenant John Caraway of the New York City Police Department who was investigating the killings. Seeing how the police were handicapped, and how crooks appeared to have the upper hand, Jethro Demont decided to become the Green Lama. To throw suspicion off himself, Dumont created the alias of the Reverand Dr. Charles Pali, another Buddhist priest, who could easily be accepted as the mysterious Green Lama. At the time, it must have been strange for two American white men residing in New York City who both claimed to be Buddhist priest, in a big world where white men being Buddhist priests were rare! But Jethro Dumont seems to have pulled it off, even if a few did suspect a dual (triple?) role. 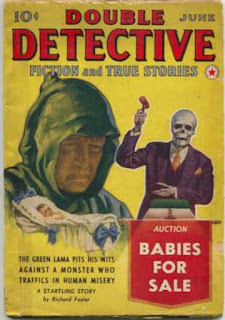 The Green Lama series began in the April 1940 issue of DOUBLE-DETECTIVE (V5 N5), running for two years in each successive issue, and finally ending after 14 stories, with the March 1943 issue (V8 N2). The author was listed as Richard Foster – real name Kendall Foster Crossen, who wrote all the stories. 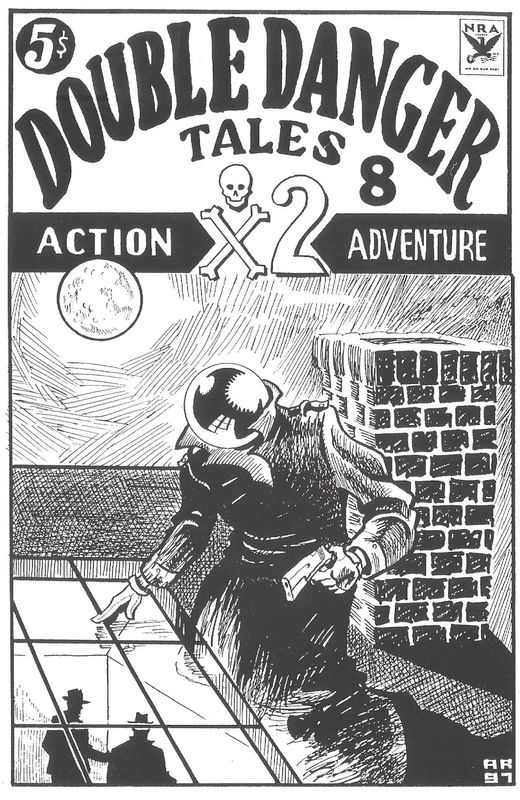 The stories were easy reading, with some nice action scenes, and some fairly good mysteries. Although the Green Lama only took the cases that were giving the police a difficult time, and were involved in organized crime – supposedly on a big scale. However, in several cases the organized crime consisted of four people: the mastermind, his lieutenant, and two hired thugs. Well, so much for the big crime. One case even lacked much action, and the murderer is known, the real mystery concerns how he escaped from the scene of the murder. Actually, the Green Lama was a fairly good clone of The Shadow. He wore all green, or dark clothing, and could blend into the shadows or his surroundings. Instead of The Shadow’s weird laugh, the Green Lama merely utters a Tibetan prayer, Om! Ma-Ni Pad-Me Hum, sending chills down the spines of evil doers – well, I guess you had to be there. Unlike The Shadow, he did not carry big automatics to do battle with the underworld. Indeed, his only weapon was a scarf – called a Kata – which he used like a whip. This and ju-jitsu. He also ingested radioactive salt which gave his touch an electrical shock. He merely had to touch a person’s nerve centers in such a way that he could make them blind, deaf, or lose their speech or mobility. As though operated by a single string, the three gunmen whirled around at the sound of the voice. But the Green Lama was already on top of them. His right hand flashed out and chopped down on the side of Butcher Mulraney’s head. The gunman dropped to the floor, his gun falling from his hand, and flopped there like a decapitated chicken. With almost the same movement, the Green Lama’s left arm had encircled the neck of the next gangster and jerked him forward, swinging him half around. The Lama’s right hand flashed downward and struck, edgewise, at the base of the skull. The gunman sagged to the floor, unconscious. The gangster’s gun spun out of his hand, a bright smear of lead along its side, while he cursed and grabbed his numbed fingers with the other hand. But his curses were cut off in the middle as the Green Lama struck again at the base of his skull. The Lama turned and stepped over to where Butcher Mulraney was still writhing on the floor. A quick blow at the base of his skull, and he relaxed into unconsciousness. The man in the bed was still propped up on one elbow, his mouth open in astonishment. But the fear was still in his face. “Sorry,” the Green Lama said, approaching the bed. “but I’m afraid we’d better have you join the party.” For the fifth time he struck a quick blow and Goo Goo Leads joined his former friends in unconsciousness. With the scarf, the Green Lama could flick it out, the end would wrap around a neck, and the gangster would quickly go into a state of unconsciousness. The scarf was not used often, but it made a good weapon in the hands of the Green Lama. The Lama did not take lives, merely leaving the criminals for the police. In one novel, the Green Lama did almost take a life, this was when he thought the gangster had killed Magga, his mysterious ally. Now, let’s take just a quick look at the main characters within the series. We will stick with only those who were the closest to the Green Lama; a number of others had recurring roles, for instance, like city officials in other towns, plus a Hollywood movie company, Magna Pictures, where many of the characters made numerous appearances. Jethro Dumont: He is a handsome, ascetic-looking man in his middle thirties; worth ten million dollars, which he had inherited from his family at age of twenty-one. He had spent ten years in Tibet studying the mystical philosophies of the Lamaists. He was one of the few white men to ever become a Lama. He had a hobby of collecting news, which he clipped from newspapers. Jethro had accidentally witnessed a gang killing on the dock upon his return to America. Two small children had been killed during the gang killing. He resides with his manservant, Tsarong. Reverend Dr. Charles Pali: He wears a dark green business suit with a light green ecclesiastical shirt and collar. On the collar the symbol Om was embroidered in black. His face is full, ruddy colored, with a touch of gray at the temples. His eyebrows reach up sharply. He has dark brown hair. The suit becomes too well known, and was dropped in the August 1941 story. Now, he still wears green, but his suit was cut along more liberal lines and the shirt and tie were those of a young businessman. His facial appearance was often changed by makeup, and now his face becomes less full, younger, and more powerful in appearance. The Green Lama: The monk’s robe reached almost to the floor, with a hood that circled his face, and a green border around the sleeves and hood. The inner lining of the robe was of golden yellow material. He wears dark felt-soled shoes, and around his neck was a dark scarf, called a Kata, five feet long. Evangl Stewart: She is often described as the most beautiful woman in America; she was a tall, slender, exotic-looking young woman with naturally wavy, ashen blond tresses that fell from her creamy shoulders. She was from a wealthy family, and rich in her own right. She fell in love with Gary Brown, and they were eventually married and had one child, a boy they named Jethro Pali Brown. She was in the first segment of novels, beginning with the first story. Her last involvement was in the August 1940 story, although she would be mentioned on and off throughout the series. Gary Brown: A college graduate in his middle twenties, he had been a hired gunman for Harlem Joe, policy king of New York City. When he had refused some gang order, he was eliminated – dumped in the East River. The Green Lama saved him, and Gary came over to his side in the fight against crime. He is tall, well built, with black hair and a handsome face, marred only by a broken nose. He falls in love with Evangl and they marry in September 1940, leaving active service with the Green Lama. His last active part was in the August 1940 story, though he would be mentioned off and on throughout the series. Jean Farrell: She is a very talkative redhead, but a woman with little fear, and quick to act. She was introduced in the August 1940 story, and became the Lama’s assistant in the following story, September 1940. She is tall, slender, and exotic looking. The Green Lama calls her, Little Netsohblum, which in Tibetan means, Thousand Parrots, because she talks too much. She was probably better suited for the part than was Evangl. Ken Clayton: He is tall, slender, good looking, about twenty-six years old, with close cropped brown hair and Robert Taylor looks. He took over Gary Brown’s role after Gary left the series. However, even while on active service with the Green Lama, Ken still acted on Broadway and pursued his career as an actor. He was drafted during the August 1941 story, and was stationed at Fort Dix, New Jersey. His first story was the August 1940 issue, but his active role began with the September 1940 story. Theodore Herrin: With Ken Clayton now in the Army, a new character is brought into the series. He was actually introduced in the February 1941 story, as a minor character. But with the August 1941 story he becomes an active member of the crew. He is a small, slender man with broad shoulders and dark hair. He is a stage magician and recognized as one of the greatest magicians since the death of Thurston. He was simply a replacement for Ken Clayton. Of the three characters who filled this position, Gary Brown was probably the best in the part. Dr. Harrison Valco, M.D. : The physician was tall, slender, well built, and in his early forties; he has a ruddy face, black hair cut short, fringed with gray. He was actually an expert in radiology, but became something of an assistant to the Green Lama in his capacity as a medical doctor. Evangl had been one of his patients in the first couple of adventures. His part was very minimal, however, and he was not always in the stories. Geshe Tsarong: He is Jethro Dumont’s servant. He is a short, squat young man of dark features and high cheekbones. Of Tibetan or Mongol caste, he is probably a Lama himself, though of lesser rank than Jethro. Lieutenant John Caraway: The police official of the series, he is assigned to the New York City Special Crime Squad, investigating organized crime. He welcomes the help of the Green Lama in solving cases for him. He is a large, rugged man, with sandy hair and a homely face, blue eyes and his hair looked like it had never been combed. 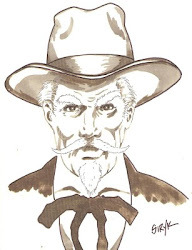 He was introduced in the first story, but is not always in the rest since they take place elsewhere than New York City. Magga: Who she is, or where she came from is a complete mystery to all concerned, Wherever the Green Lama went to wage his war on crime, there he always found Magga. Either she would save the Green Lama’s life, or he would rescue her from some trap in each story. Her name in the Pali language meant, the way; the path. She was young and beautiful, and she and the Green Lama were in love with each other. Where the Lama was in the Buddhist faith, Magga was considered a Jetsuruna. A Buddhist nun of high rank. Basically, these were the main characters that assisted the Green Lama in his cases. They were well thought out, and the stories were better for their involvement in them. Again, if the reader has the opportunity, the series should be read in order of publication, as the complete series is like one long novel. But if the reader must read them out of order, the stories are each individual adventures, and fun reading one story at a time. 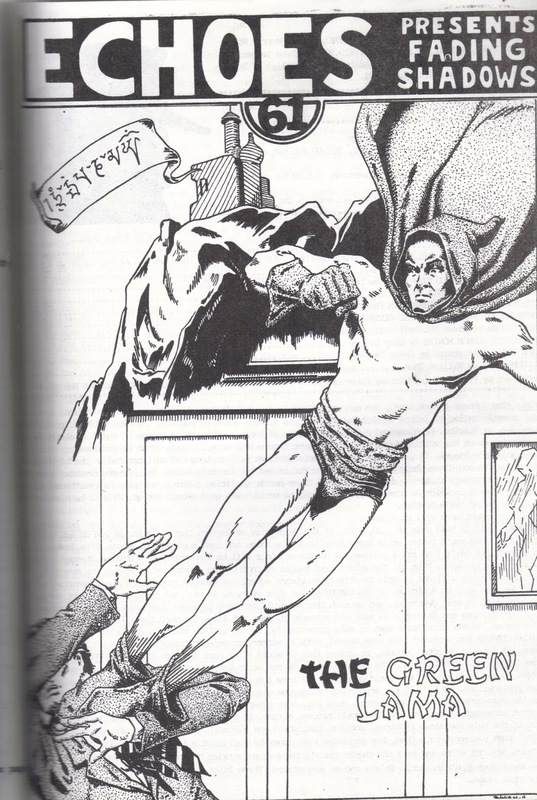 The Green Lama was a fascinating pulp hero, but I think the mysterious Magga was even more so. There was little mystery about the Green Lama, while Magga was as much a mystery to him as she was to the reader. She has a strong personality in her own right. With the many mystic attributions to the character of the Green Lama – he could make the dead speak, create his own double out of thin air, see people he is familiar with no matter where they are (thus is able to locate his captured aides when they are held prisoner). I asked the expert on the Green Lama, Nick Carr about Magga, and he said that Ken Crossman had told him personally that Magga was a character he never planned to reveal much about. She was to remain mysterious. So whatever her true story is, Magga is never revealed in the series. She was a master of disguise, and usually appeared as a young woman, or an extremely old woman (and here I’m reminded of the Tocsin from Jimmie Dale), never the same in any two novels. In one story, The Case of the Crooked Cane, Magga disguises herself as Betty Dale, a reporter for the Globe. What a wonderful disguise! Betty Dale, of course, was the love interest of Secret Agent X, and she was a reporter for the Herald. Coincidence? I don’t think so. Ken Crossen was merely paying homage to both Jimmy Dale and Secret Agent X. A special thanks go to Nick Carr who made this article possible. For the readers, this is only an overview of the series; to learn more about the series, the characters, and the author of the Green Lama, I highly suggest they search out back issues of ECHOES (#19 & 20), for an in-depth article titled, Om! Ma-NiPad-Me Hum by Nick Carr. This article will give you much more information. 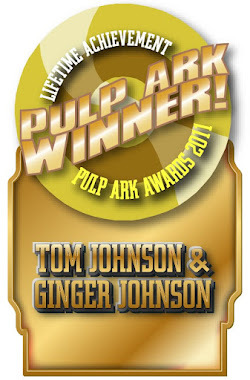 In the meantime, if you are looking for a quick read with action and mystery, check out a Green Lama story. You’ll be glad you did. Lance Curry: He is in his 60s now, was born, raised, educated, and still lives in South Sioux City, Nebraska. He has been a janitor, movie usher, Pizza Hut cook, grocery store clerk, carpet, vinyl tile, and suspended ceiling installer. He has also worked as a Wells Fargo armored guard, and maybe a few other professions. 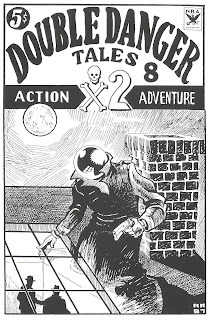 As a great fan of Doc Savage and the pulps, he has had several stories published in Classic Pulp Fiction Stories, Weird Stories, Detective Mysteries Stories, and Double Danger Tales. 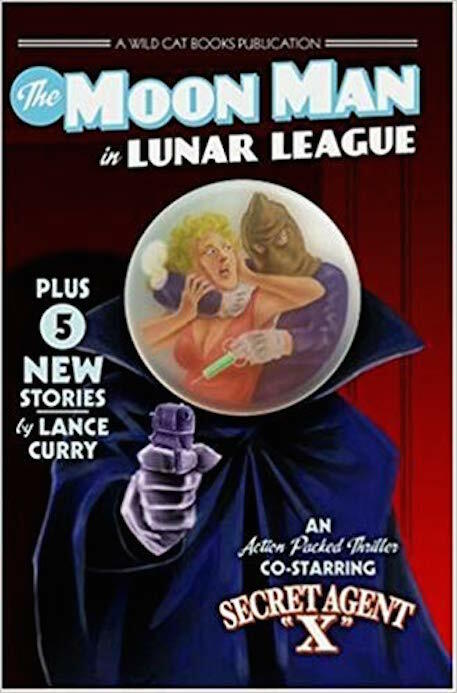 He was the first to crossover Secret Agent X and The Moon Man, plus wrote an early pastiche of Doc Savage (also rewritten into a Phantom Detective novel for publication). 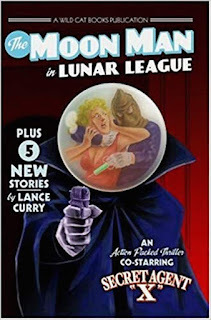 In 2006, Wild Cat Books released a collected volume of his Moon Man stories containing five short stories, plus Lunar League, the Moon Man-Secret Agent X crossover.